Towards the end of her three-month research residency at Het Wilde Weten, curator Kris Dittel will talk about her interest in the human voice and its use in artistic practices, and outline some ideas and future plans concerning this topic. Post-opera is a term coined by musicologist Jelena Novak, referring to the reinvention of the relation between the singing body and the voice in contemporary opera. 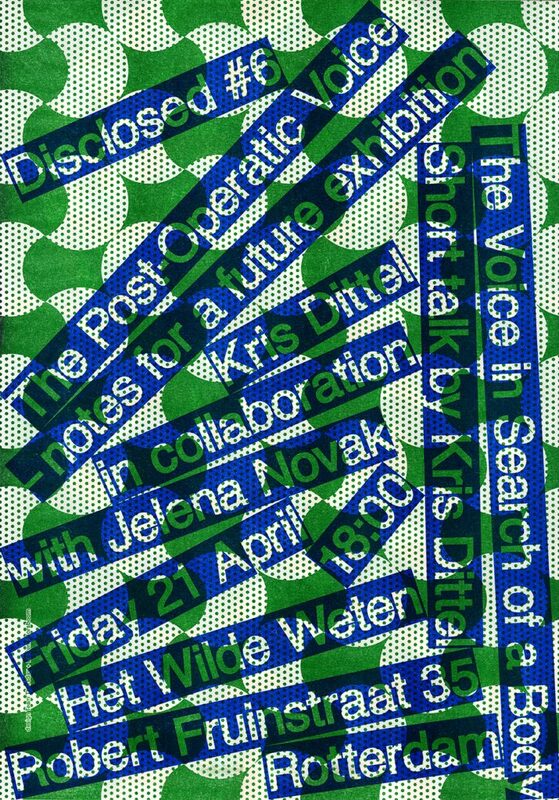 Since many of its characteristics are applicable to works of contemporary art, in this conversation with Kris Dittel they will bring up examples from both fields, in order to define the post-operatic voice and its relevance today, inside and outside of their disciplines. Kris Dittel is a curator and editor, currently associate at the project space and art book publisher Onomatopee in Eindhoven. Together with Sara Giannini she also forms The Translation Trip, a research trajectory investigating translation as practice, philosophical notion and artistic/curatorial device. Current research interests include the use of the human voice in artistic practices and an investigation on the relation between art and value. Jelena Novak works as a musicologist, dramaturge, theorist, lecturer and critic. She is postdoc research fellow at Universidade NOVA de Lisboa. Novak investigates contemporary music, voice and especially recent music theatre and opera in relation to the new media and economy of late capitalism. Her latest book is Postopera: Reinventing the Voice-Body (Ashgate 2015). This event is part of the public program DISCLOSED initiated by the members of Het Wilde Weten. Every six weeks one of the members will host a public event that derives directly from their artistic practice. This will result in a lively series of talks, exhibitions, screenings, performances and more, disclosing the energy and pluriformity of the collective and creating public moments to meet and interact.